PanARMENIAN.Net - Charges have been brought against former Armenian Prime Minister Hovik Abrahamyan, the former official said himself in a Facebook post. 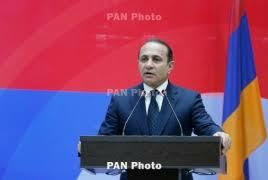 Abrahamyan revealed that ha has signed an undertaking not to leave place of residence. He noted that about a month ago a number of masked persons "allegedly on the basis of obtaining operational data, broke into apartments and structures belonging to me and my relatives." "In an interview on September 4, I criticized such behavior by the Armenian authorities. As a result, one day after the interview I was summoned to the Special Investigation Service as a witness," the former PM said. "After being questioned as part of a fake criminal case, they brought unfounded charges against me and had me sign an undertaking not to leave my place of residence."